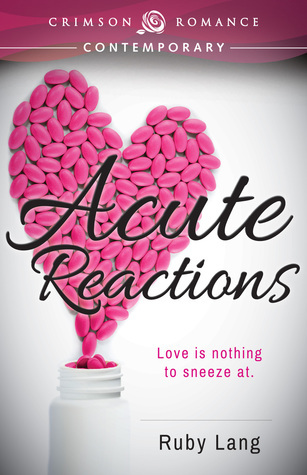 Acute Reactions is a contemporary romance set in the Pacific Northwest (which I’m beginning to think is the law for contemporary romances these days…) about two fairly broken folks who find love. On the surface, it’s that simple. There are no motorcycle gangs here, no MMA fighters, just two professional people with parental baggage which has led to difficulty trusting others and being vulnerable. It is for that reason that this story is well worth reading. These characters – Ian and Petra – pissed me off regularly. I wanted to smack them both and tell them that being honest with the other person was not actually going to kill them. I wanted to tell Petra that she couldn’t actually control the world and that taking risks wasn’t bad and wanted to tel Ian that he was about to work himself into an early grave. The reason I say the story is worth reading even though the characters pissed me off was that they felt that real. I couldn’t understand their motivations because humans are mysterious. I didn’t always empathize with them because there are people I can’t do that with. This is one of those books where I feel like there are real people named Petra and Ian living somewhere in the PNW stumbling towards their happily ever after. One of the fun aspects of this was that it’s clear both characters are not Caucasian and that’s both a big deal and not a deal at all. There’s been loads of chatter on the Internet in recent months about how much we need diverse romance novels and I agree! But we also have loads that are getting overlooked! Ian is, I believe, half-Latino and Petra is half-Indian. They make reference to how each has “ambiguous ethnic looks” which has both helped and harmed their socialization. I wish that would have been delved into a bit more, actually, and hope that Lang explores the race and/or cultural trappings of her characters in future novels. All in all, this one is a good, solid read for anyone who enjoys medical romances, romances where people are stupid and then vulnerable and then smart, and romances where everyone feels real. Enjoy it with a glass of wine. While I’m not sure if Petra and her mother are co-dependent, there is an element of it in there – they’re symbiotic somehow. If that’s something you’re dealing with, click here for a good article regarding codependency. I received a copy of this book directly from the author in exchange for an honest review. Thanks, Ruby!